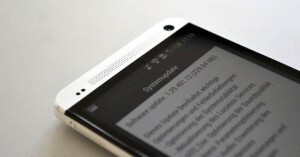 Android 4.3 Jelly Bean Update Confirmed For HTC One. Better late than never, don’t you think so? We did hear whispers in the past concerning the HTC One skipping Android 4.2 and going straight to Android 4.3 Jelly Bean, and just a couple of weeks ago, there was also mention that the HTC One would be on the receiving end of the Android 4.3 Jelly Bean update before the end of Septembe. Well, we are definitely arriving near the end of this particular month, and this time around, we have word from Jason MacKenzie that the HTC One Android 4.3 update will arrive for customers in Canada before September is over, and you can bet your bottom dollar that the very same update should hit the US in due time, and hopefully not too long after their neighbors in the Great White North received theirs, of course. Needless to say, most of us are optimistically looking ahead to a late September rollout for the Android 4.3 Jelly Bean update, but assuming there are some hiccups along the way, we do not mind adopting a waiting attitude. After all, after waiting for so long without anything happening, it would not hurt just to sit it out for a little while longer, right? In the meantime, we should keep our fingers crossed to see just what the folks over at HTC are going to do in order to deliver the Android 4.3 update to various mobile carriers in the US. HTC One owners on AT&T, Sprint, T-Mobile and in all probability, Verizon, should get a glimpse of Android 4.3 somewhere down the road. A firmware update like Android 4.3 Jelly Bean would certainly breathe new life into the legs of HTC’s flagship smartphone, as it continues to duke it out among the other high end models in the hugely competitive smartphone industry with the likes of the Samsung Galaxy S4, the recently revealed iPhone 5s as well as other Android-powered models from different manufacturers.